LOS ANGELES, Calif., July 23, 2014 – YATES ELECTROSPACE CORPORATION (www.flightofthecentury.com) today announced the Fédération Aéronautique Internationale (FAI) has ratified all five electric airplane world records set by American Test Pilot Chip Yates in the experimental, battery-powered Long-ESA aircraft built by aerospace engineers at Yates Electrospace Corporation. The approval by the FAI comes on the heels of ratification of the same five record-setting performances as official U.S. National records by the National Aeronautic Association (NAA). In addition to being the first world records ever to be set in the FAI’s newly created electric category, the performances are significant because they equal or exceed the capabilities of most single-engine gasoline powered airplanes available from the world’s top manufacturers. Yates Electrospace Corporation is interested in partnering with aerospace companies to use this technology to advance the civilian and military electric airplane industry in manned and unmanned applications. 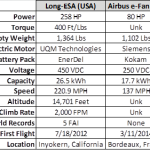 At a ready-to-fly weight of 1,540 pounds including Pilot Chip Yates, the Long-ESA records fall into the FAI’s “C-1b Group VI” class: Electric Land Airplanes weighing 1,102-2,205 pounds. The most surprising world record is the “Time to Climb to a Height of 3,000 Meters” result of 5 minutes and 32 seconds, which was selected by the NAA as the “Most Memorable Aviation Record of 2013.” From a dead stop on the runway to the acceleration, take-off and climb to 9,843 feet above ground level (3,000 meters), the electric airplane made use of its 258 horsepower and 400 foot-pounds of torque to produce a sustained climb rate of 2,000 feet-per-minute, which beats the published specifications of any gasoline piston single airplane currently for sale. 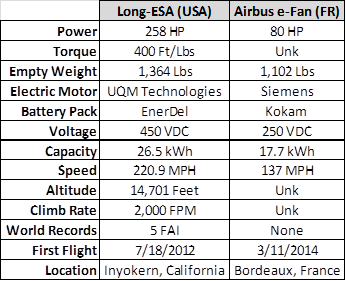 Yates Electrospace chose a UQM Technologies (NYSE: UQM) high-performance electric motor, which does not require oxygen and, in conjunction with an EnerDel advanced lithium-ion battery pack, has demonstrated constant power at 93% thermal efficiency from the ground all the way to 15,000 feet in flight testing to date. The aircraft is capable of regenerating electrical power during descents with an on-board kinetic energy recovery system (“KERS”). The low heat and radar signature demonstrated during the world record attempts captured the attention of the U.S. Navy who signed a joint research and development contract (NCRADA-NAWCWDCL-13-246) with Yates Electrospace Corporation to advance the company’s hybrid-electric stealth UAV design known as Silent Arrow™. Yates Electrospace Corporation is also developing a capability to allow mid-air recharging of electric airplanes while in flight and has filed several patents in this research area leading up to a planned flight demonstration of a mid-air recharge in late 2014 or early 2015. In 2012 Chip was named a “Pioneer of Aviation” by the State of California. He holds more than ten patents and a Master’s Degree from the University of Southern California. Chip is a passionate advocate for Science, Technology, Engineering, and Math (STEM) education and outreach, and was recently named the National Spokesman for the Conrad Foundation, which celebrates the life and entrepreneurial spirit of astronaut Pete Conrad, the third man to walk on the moon. He also recently launched www.rockstarofscience.com to promote his STEM speaking tour to schools, and is writing a book to encourage kids to overcome adversity in pursuit of their dreams entitled “The Hoodlum Diaries” due out in 2015. For more information about Chip Yates please visit www.flightofthecentury.com or follow him on Twitter @ChipFlight.